This is a funny nightcap cocktail with both brandy and dark rum, and a ton of milk. There's a ton of rich "Milk" or "Cow" named drinks that all have this same rich profile. See the Tiger's Milk and Mother's Milk as examples--the Irish Cow and Liebfraumilch for others. Most of them are pretty bad--just saying. This one is at least strong and cold, though I could see it done hot. 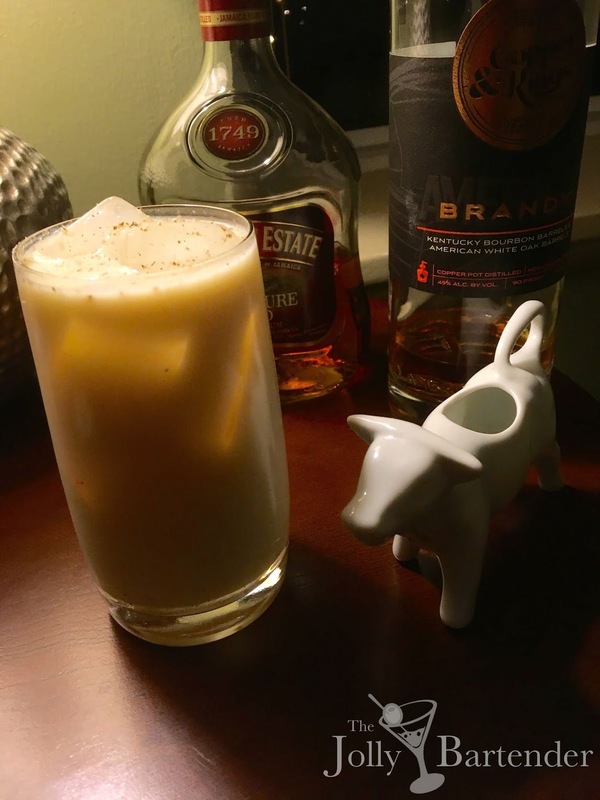 The nutmeg sprinkles are really a feature of most of these "Milk" drinks, which also makes them suitable for winter drinking as well as nightcaps. Combine all ingredients except nutmeg in a shaker with ice. Shake and pour into a chilled highball glass and sprinkle with fresh ground nutmeg.